Two years ago we moved out of a house we were renting and into a house we bought with our own money dollars. For the most part, I considered this moving up in the world, save for one thing: we managed accidentally to put our DS Lite into a box we donated to Goodwill. And with it went all of our games, and perhaps more importantly, our saves. At least, that's what I thought had happened. A couple months ago my wife was rummaging through the garage and found the DS again! The most exciting part of this was rejoining my copy of The World Ends With You and my save game in which I'd just started my second playthrough. Now that I'm playing it again, I want to gush about it. I want to gush so much it'll make you sick. I'm now going to claim this is hands-down the best DS game ever made, at least in its genre, which is... er... action RPG, I guess? The closest comparison is probably to Pokemans. If you try to dispute my claim, I'll call you a fanboy, in the usual internet fashion. After all, there are such things as wrong opinions, right? I heard that once. There are so many aspects and elements to this game that are amazing, I'm just going to run through many of them. A survey, if you will. Not the kind you fill out, but the type that fills you out. You know, broadens your horizons. I'm also going to keep this basically spoiler-free, since not many people have played this, but everybody should. If I show characters or dialogue, I've been careful to show them without any particularly revealing context. Finally, please excuse my bad camera-work and image editing skills. Probably the first reason this game appealed to me is simply its aesthetic. the game isn't stylized, but it is stylish. It takes place in trendy trendy Tokyo, where everyone watches what they wear and things like trendiness have actual gameplay relevance. There is a diverse range of clothing worn by the characters you find in the game, from business suits to weird designer clothes to--my favorite--hooded sweatshirts, baggy jeans, and chains. It's all crafted very carefully and contributes in a large way to the atmosphere of the game. You'll also see a lot of graffiti art throughout--another style that really appeals to me. But it's not all just pretty looks. As I mentioned, there's gameplay relevance here. The brands of clothes that you wear and pins that you use influence the trends in the area, and trendier brands are more effective in combat. 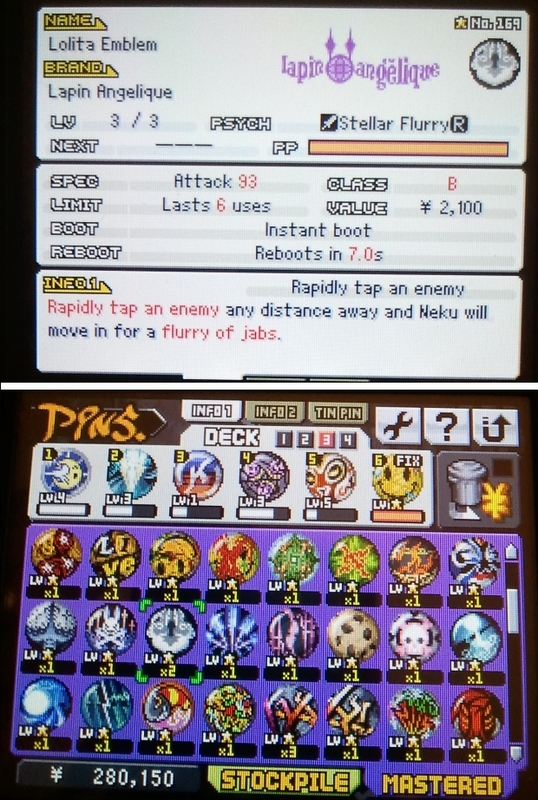 And when you equip certain sets of pins (like the four above) at the same time, they have additional special abilities. Pins. What are pins? We just don't know. I keep talking about these "pin" things. Remember pogs? Pins are eerily like those. You collect them. They have cool designs on them. You use them in combat. Actually, you use them in two different types of combat, the second of which is also eerily like the actual game of pogs (if you remember the existence of such a thing). I love the pins in this game. There are over three hundred of them, and they all have cool designs and names. I find the designs visually appealing, but I also like that they come in sets and series with some style and similarity like I talked about above. It's fun to try to collect whole sets. - Eyes Full of Light: Keep the stylus trained on an enemy to focus light upon them. Inflicts continuous damage and sometimes Attack Break. - Network Spider: Touch an enemy to strike it with lightning. Touch additional enemies while the lightning flashes for a combo. - Wassup Thunder! : Start on empty space and drag across one or more enemies to lock on, then lift the stylus to strike targets with lightning bolts. - Thunder Pawn: Draw a circle in empty space to create an electric charge that zigzags around the screen. Inflicts damage on contact. - Fresh Line: Slash vertically down on an enemy and Neku will teleport to it and attack with a downward stab. Pins don't just stay still. They level up with combat and other activities. As they level up, various attributes improve, such as damage, number of uses, or recharge time. Some pins also have the chance of evolving into other pins, usually a progression of pins from the same brand. Sometimes the only way to get the best pin in a set is to evolve a pin from the first in the set all the way to the last. Along these lines, it's worth saying that there are actually three different types of PP (pin points - think XP for pins). Battle PP is gained through winning fights. Shutdown PP is gained by having a deck equipped and then turning off the DS for some amount of time. Access PP is gained by entering a special "mingle mode" that is so special I'll describe it more later. Some pins have different evolution paths (or might only evolve) with certain types of PP, so it's important to keep track of what deck you have equipped when doing something even as simple as quitting the game. I will shamelessly admit that I use a strategy guide to help plan my decks for proper evolution, since I'm trying to get 100% pin mastery. OK boss, combat is way interesting and involved than just picking powerful pins--though that is a major component of it. In combat, you fight on both screens simultaneously. 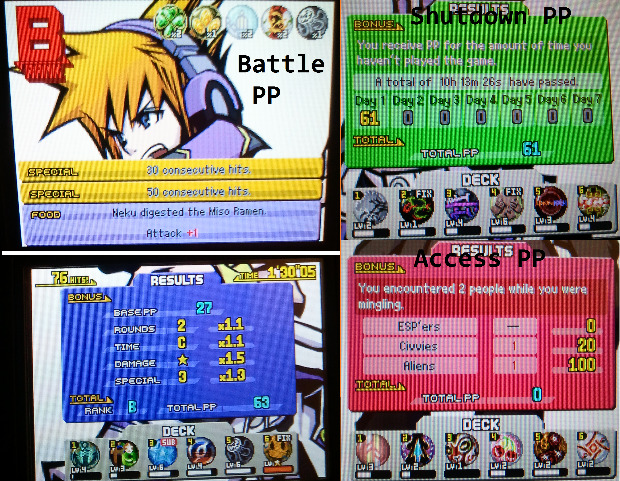 On the bottom screen, you use flail the stylus wildly to execute various attacks with your pins. On the top screen, you button mash the d-pad to have your partner do a totally separate set of attacks independent of your choice of pins. It's difficult, a little chaotic, but extremely rewarding if you can pull it off. You play both screens AT THE SAME TIME. Ladies, you will probably have better success here than we will, since you are masters (mistresses?) of multitasking. There are a bunch more aspects to combat that I won't go into, but will just mention in passing: combo stars, blocking/dodging, stunning enemies, supercharge attacks, sync rate, countering, finishers... the list goes on. Perhaps the best part about all of this is that for 90% of the game, you can ignore as much of this stuff as you want. There's an auto-play mode for your partner, so you can focus on the bottom screen and just let him survive up there. You and your partner share a pool of health, though, so for some of the harder fights you may have to pad his skills with a little more direction. 50 hours into the game and the n00b I am still mainly just plays on the bottom screen. It's an RPG, right? So there's stats, right? Relax, RPG junkie. Yes, there are many of the usual RPG elements in this game. Your character has stats; he can wear equipment; he levels up. 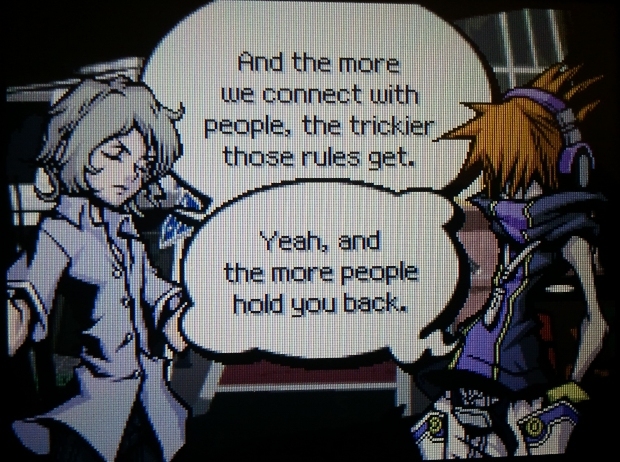 But there are twists on all of these things that make TWEWY unique, like those crazy spiral straws you loved when you were ten. Your character has four stats: HP, Attack, Defense, and Bravery. The last of these bears explaining. It's basically a measure of how awesome the equipment you wear can be. All equipment items have a bravery requirement. I guess this is an alternative to a level requirement. Of course, cooler equipment has a higher requirement. But wait, it gets more interesting. All four of these stats increase a bit when you level, but you can also permanently increase them with any food item you consume. So those pancakes Joshua is eating? He'll get a permanent boost to bravery after he finishes eating them. Which takes as many battles as little squares filled up there. Some of the really expensive food have disgustingly large benefits. It's cool that you get so much choice about what stats to increase. And your level? Yeah, it's there, but it has kind of a strange purpose: mainly, you can use it to handicap yourself to get better items. In the picture, you can see that I'm level "1/73". That means I'm actually level 73, but by using that "LVG" slider, I've handicapped my HP so that I have the equivalent HP of a level 1 character. But the benefit is the "Drop Rate" at the bottom right is up to 73 instead of 1. Drop rate, as you might guess, affects the kind of loot I get from killing an enemy. With the game's in-game encyclopedia it will actually show me the percentage chance of getting good loot from each specific enemy with my current drop rate. There are probably over 20 different shops in the game, which you gradually gain access to as the story progresses. 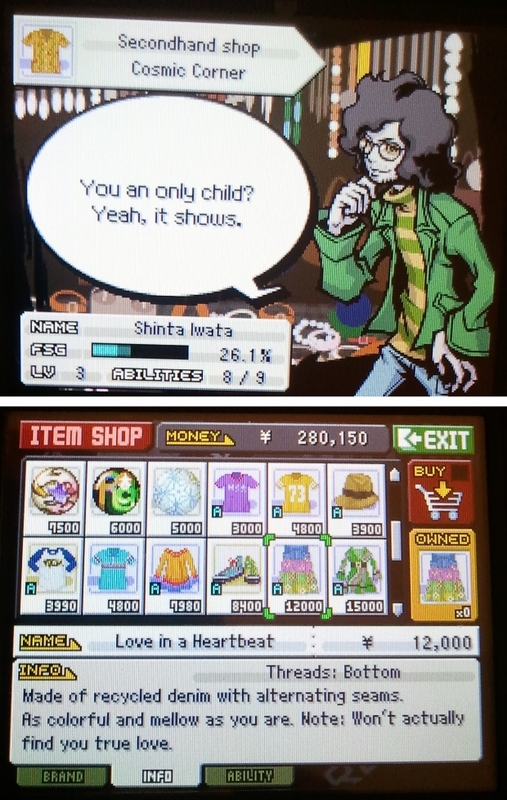 In its usual style, the game has an interesting take on shops. Yeah, this guy is a real treat to shop from. Each shop has a distinctive shopkeeper with a unique personality (at least ostensibly). They say different things to you when you enter, leave, buy items, or not buy items. Some are super snarky; others seem pretty cool; one even seems to have the hots for you! As you buy items in a shop, your relationship with the shopkeeper improves. okay, okay, you level up your relationship with them. It shows it on a freaking gauge there. So they will treat you differently if you buy lots of stuff from them. Makes sense, I guess. Besides the purely aesthetic dialogue differences, being friends with a shopkeeper unlocks items' abilities. Each equipment item has both a set of stat boosts (HP, attack, and defense) and a (initially hidden) special ability. The ability is not activated until you discover it, which is only possible by a shopkeeper's unveiling of it, which in turn only happens when you buy lots of their wares. For special items you get from quests, you also have to figure out which shopkeeper will tell you the ability. I would guess I've unlocked maybe 75% of my items' abilities. It's not really easy, but considering how awesome some abilities are, it's totally worth it. 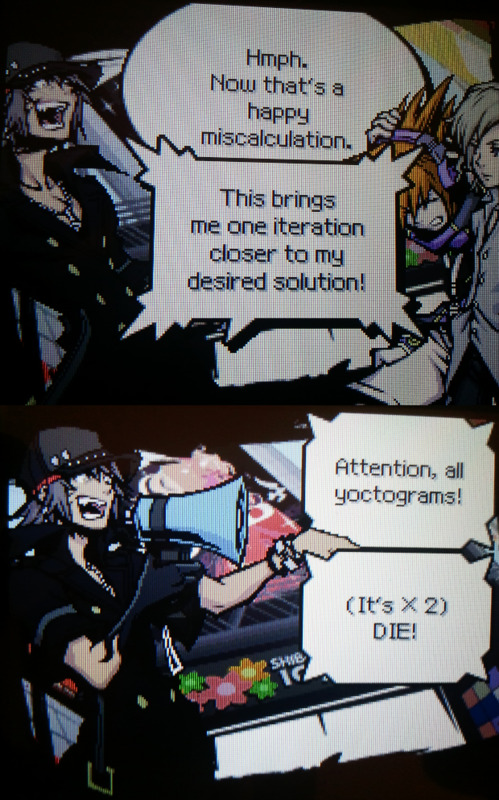 The story in The World Ends With You is, simply put, great. 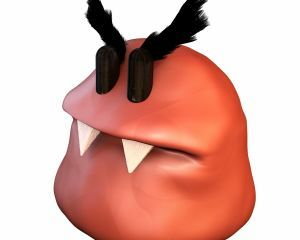 Your character is dropped into a mysterious game and over the course of roughly three weeks--segmented into daily chapters--unravels the some of the madness around him. 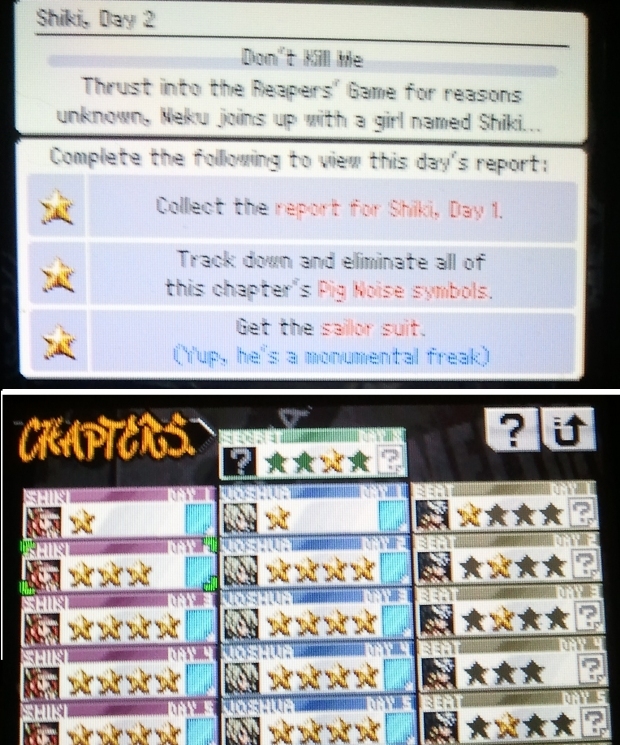 The main character, Neku, starts as an anti-social, introverted emo kid, but suffers many serious, life-changing events, and experiences real character growth. In fact, this happens to several characters. It's not often I am able to applaud a game for great character development, but this is one of those cases. I absolutley love this weird dude. Along the way you meet a ton of different characters, some minor, some major, some reoccurring, all unique and distinctive, from their outfits to their speech mannerisms to their gestures. Some characters you hate will show up several times. Some characters you love will...not. 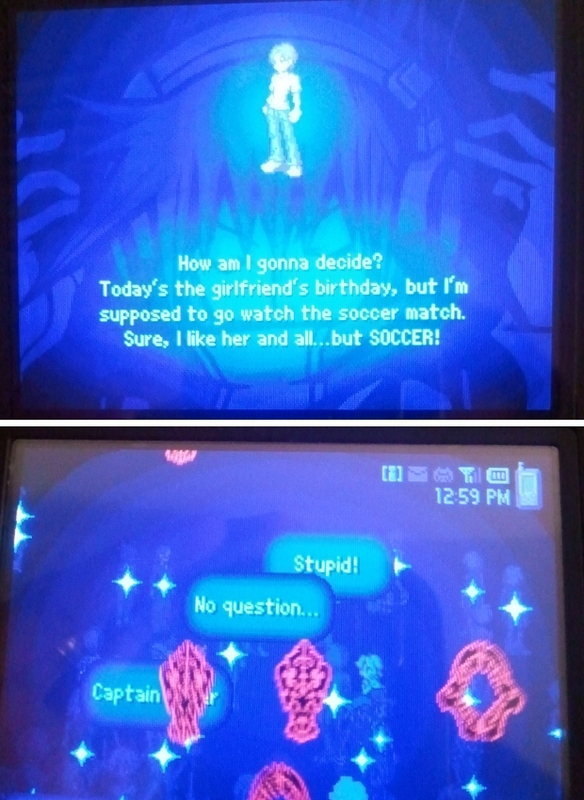 I find the dialogue to be pretty awesome. 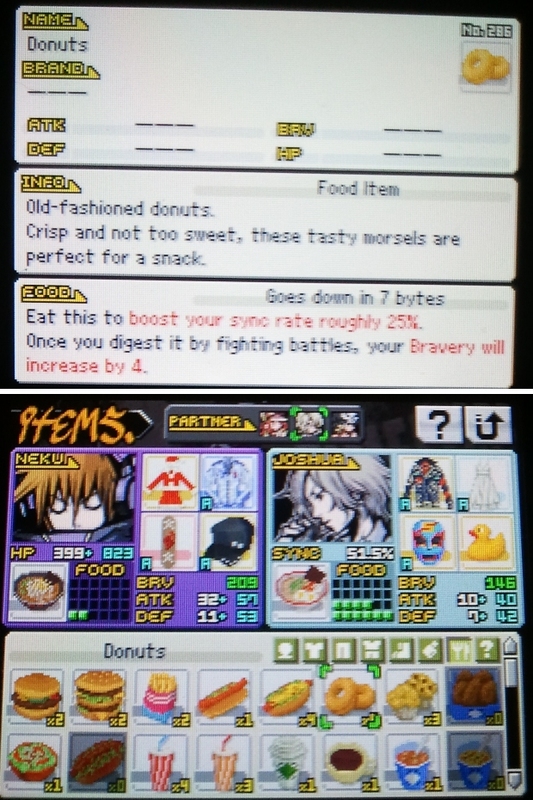 The writing is really solid, and you have the added bonus of being able to hear Neku's thoughts. In many situations when someone says something stupid or nonsensical, Neku totally calls it out in his mind, like "What are you talking about? A minute ago you said you hated french fries!" 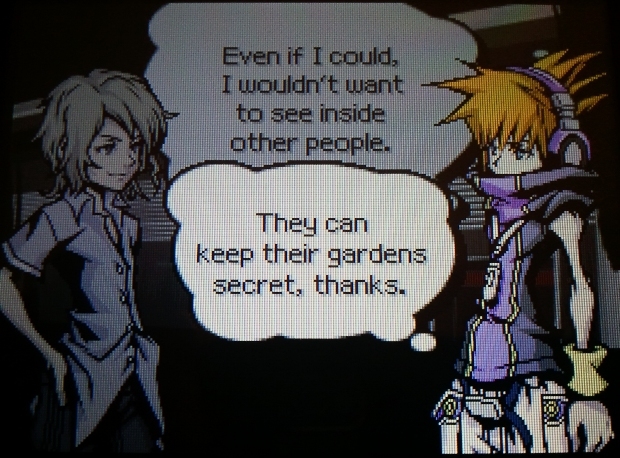 I love the sarcastic asides you get to experience through Neku's thoughts. He's not a particularly likeable character (especially at first), but he has his own charm. In place of talking to random characters, there's a feature called "scanning" where you can read the minds of people wandering the world. There are a whole lot of different sayings, and many of them are pretty amusing. Speaking of the story, it is a bit complicated if you try to delve into it deeply. On your second playthrough you can complete certain objectives for each chapter. Usually these involve acquiring a special item by doing something weird in the story line and defeating some tough minibosses. By doing so, you unlock the "secret report" for that chapter, which explains in way more detail the things that happened. 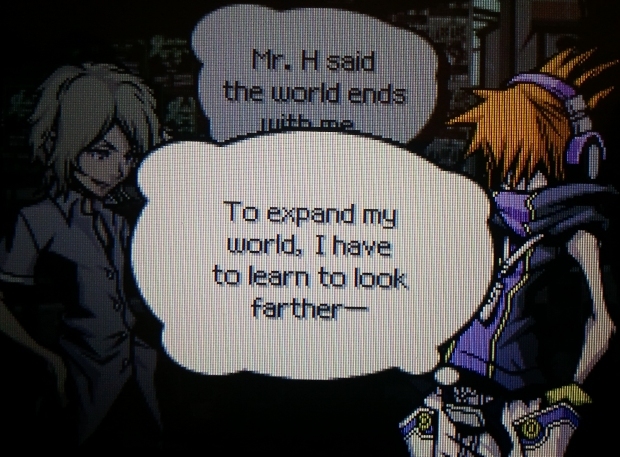 I now have a much better grasp of the various players in the convoluted game that is the story of The World Ends With You. I love it when games do this: there's basically a second, whole, separate game built into this game. It's called Tin Pin Slammer. 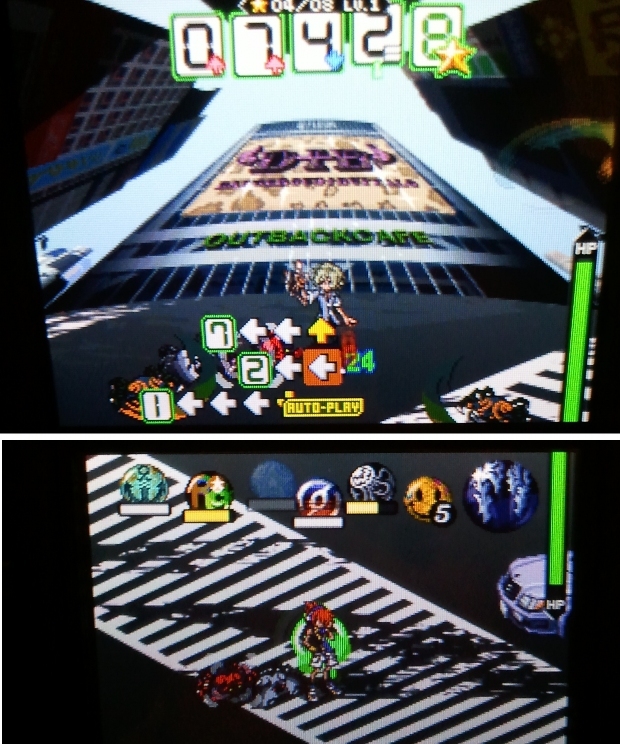 In the world of TWEWY, Tin Pin Slammer is a pogs-like game where people flick their pins against each other and try to knock them off the edge of a board. There are special attacks and defenses built in, too. Each pin has a separate set of stats for Tin Pin, and there are a set of pins especially made for playing it. You use the stylus to direct your pin into the opponent's pin. D-pad to activate special attacks. It's surprisingly well polished and pretty fun to play, even against the computer. There's also a versus mode where you can play against other people over wifi. I haven't yet had the pleasure of doing that. Maybe at PAX next year? The last praise I wanted to give was around some of the unique things the game does to integrate with the real world. One example is a few sets of pins out of which only one pin can be purchased at a certain shop. If you want to purchase the other pins in the set from that shop, you have to put your game cartridge into a different DS. A minor thing, but it bridges the gap between the game and the real world. - Grizzly: Shout into the microphone to create a shock wave. Inflicts continuous damage on all enemies and sometimes HP Drain. - Lightning Anger: Blow into the microphone and Neku will attack with a spinning slash. Inflicts damage on surrounding enemies. While I don't actually ever use either of these pins, since I'm usually not somewhere I can both use these triggers and retain my dignity and/or job, I think they're another interesting use of the DS hardware. Had this game been released for the DSi, I guarantee they would have had a trigger involving taking a picture of something with the DS camera, maybe a light or dark object. I totally need to do this at PAX someday. Earlier I mentioned something called Access PP, which is gained through a special "mingle mode". 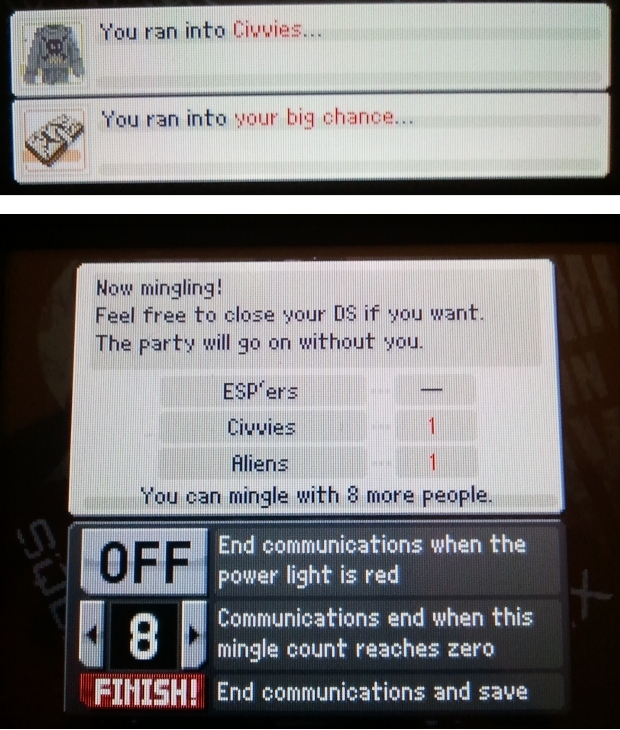 In mingle mode, your DS wireless is turned on, and you get Access PP for different people you encounter. 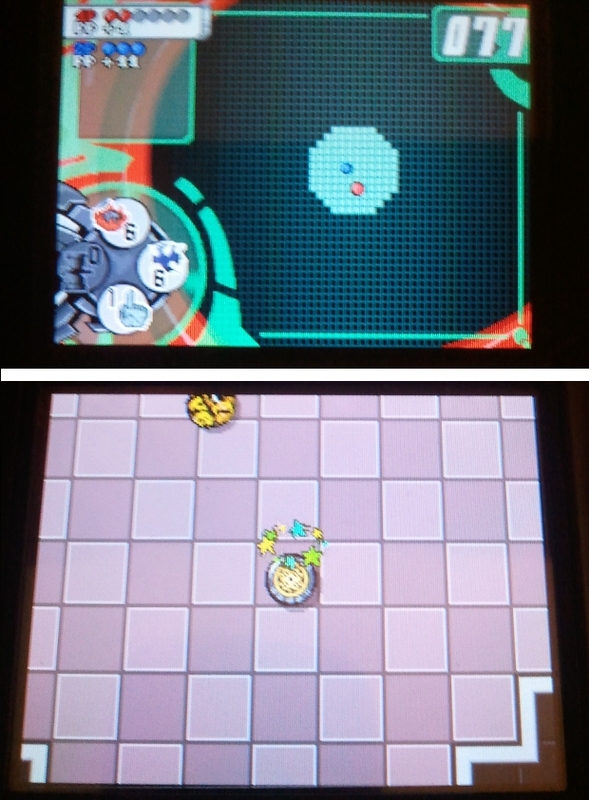 You can encounter an ESPer (someone else in TWEWY's mingle mode), a Civvie (someone playing a different DS game with their wireless mode enabled), or an Alien (some kind of random encounter). It's like your pins are being affected by phenomena in the real world. And of course, Shutdown PP is gained by not playing the DS, another act taking place outside of the game. You could accuse these things of breaking the fourth wall a bit, and maybe that sort of thing bothers you, but I find them to be interesting features you don't find in many games. Oddly enough, the one single aspect of this game I really dislike is the music. 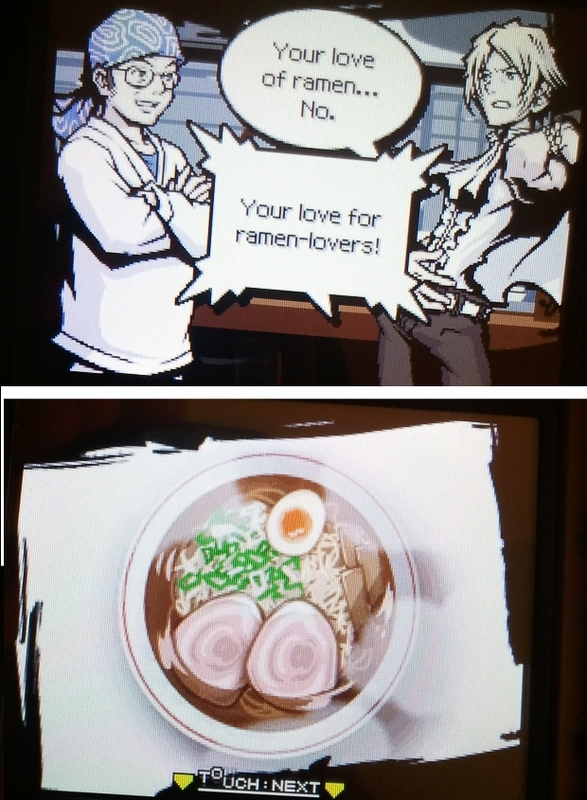 Like Jet Set Radio, TWEWY has this weird rap-like stuff that I just can't get behind. Some people like this kind of thing, though, and if that's you, then you're in for a treat. You can buy tracks from shopkeepers, and there are a lot of them, like 30+. Well, I hope I've convinced you to try this, or at least piqued your interest to seek it out. It might be a little hard to find, but if you can, it's well worth it. If you do have it, I hope we can meet up at PAX next year and play some Tin Pin Slammer. Slam On!